When I got back an old friend of mine named Katie, who was in my bible study a few years ago at a Fuge Camp in Glorieta, NM, facebook chatted “hello”. I said “Hi” and she explained that I probably didn’t remember who she was, but that she needed prayer for her cussing problem and asked if I would pray for her. People sharing prayer concerns online make me smile. She mentioned that she had this problem for a while now, and that she’d tried a lot of things to stop it. She was getting to the point where she felt guilty. Her friends from church would know that her heart wasn’t right because her tongue was revealing its true darkness. She would go to church and act one way and the very next day she would flood her speech with filthy, vulgar language. Hurtful, angry, arrogant, nasty, you name it, it came out. Katie didn’t go into details about this, but she didn’t have to. I knew exactly how she felt. I picked up cussing in high school at first just to fit in with the in-crowd, but then it got so addicting and fun that within a few days I did it for no reason. She felt guilty. According to what her mind was telling her, she was a horrible person and a hypocrite for leading such a double-life. When I asked Katie what she had done in the past to try to stop cussing, her answer scared me. She had done things to inflict pain on herself so that she would correlate pain with her sin. Whoever told her that this was a good idea should be shot. She hadn’t done anything drastic like cutting or marking as far as I knew, but she was doing little things like snapping rubber bands or telling her friends. “hey, punch me in the arm if I cuss in front of you.” She’d tried those and they weren’t working. She still cussed. There’s a deeply spiritual reason for why they didn’t help. Inflicting pain for sin is pointless. Christ already paid in full the price for sin. Hurting ourselves more is insulting God’s power, it is denying Christ’s effectiveness in wiping away every last consequence for our sin. Besides if we really understood it, the consequence for sin was death. Feeling guilty and wanting to inflict pain would be trivial in comparison with our real sentencing: the separation from God for eternity. So i told Katie that her problem was rooted in her focus being off of where it needs to be. She had messed up her priorities and lined them up in a bogus order. It didn’t take much insight to know that cussing wasn’t the only negative thing going on in her life. In fact, she told me that she had a horrible temper, she could be set off instantaneously with the smallest of words. Here’s the most beautiful thing about this conversation; Michael Wells’ story about ordering our priorities around Christ had just finished playing in my earphones. 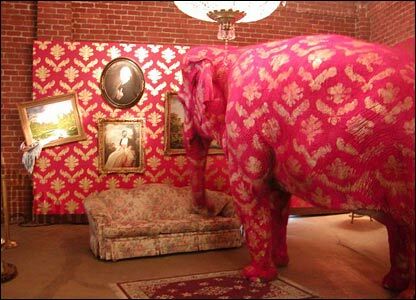 He describes our sin like this: Imagine in the room that you’re in right now, there is a huge pink elephant with black polka dots all over it. Picture that image, get acquainted with that thought for a second. Focus on the elephant. Now forget it. Forget what you just imagined. Forget what you were focused on. You can’t. You cannot forget something if you’re thinking about it and focused on it. So what does she need to do? I knew that if I told her that she needed to do anything she’d be suspicious and probably reject anything I told her. So i said, “Christ is already in you, and you don’t need to work to keep him there. The only thing you can do is recognize him revealing himself to you. He has forgiven you and lives in you. He loves you, in spite of the cussing because He bought you and He has already paid the price for everything you are and are not. The truth is that He’s given himself to you and keeping your eyes on him is all you will ever need. You don’t have to do anything else. Focus on Christ and the image of our sin goes away. Focus on Christ and the things we were focused on before are shifted and He is revealed. Focus on Christ and the pink elephant with black polka dots is just a distant memory from the past. The places that are our biggest weaknesses are where Christ is going to reveal himself the most. He even works through crooked broken people to comfort us and to reveal himself to us. Praise God for his matchless wonder and his unending grace. He alone is able to save. I asked myself after talking to Katie if I was going to be able to take my own words and apply them to my own life. Truth be told, I’ve been fighting it. My weaknesses are sometimes overwhelming and I’ve been working too hard to make everything the way I want it. Christ needs to always be my focus and sometimes He’s not. Thanks for writing this all out and posting it! Isn’t it funny how God likes to make the most simple things so profound and so easy to look over?! Obviously Christ should be our focus- and yet when trials come we look to see how we can change things all on our own- thanks for pointing others to Christ! We all need help reminding each other where our focus should be. Keep staying in tune with Him!